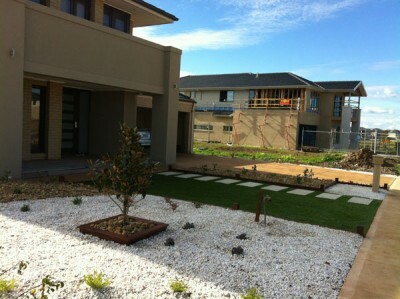 Everlast Services provides fencing, landscaping and concreting service throughout Melbourne. We’re a family owned and operated company that have been providing fencing, concreting and landscaping services in Melbourne for over 20 years. We manufacture all our steel products on site at our state-of-the-art steel fabrication factory, meaning we can keep costs low by cutting out the middleman and stand by the quality of our products. We only source Australian made and owned materials meaning a decision to go with Everlast is a decision to support the local economy. We have gone to great lengths to create a team that have a depth of experience and a variety of talents to ensure we have all bases covered and can give our clients exactly what they’re looking for. We have built a reputation for delivering the highest quality products at an affordable price because at Everlast we don’t believe that quality has to be expensive. Aluminium Slat Fencing: Stylish, modern and easy to maintain. Steel Fencing: Looks amazing and will last forever.. Swimming Pool Fencing: Safe, compliant and will add a visual element to your pool. Industrial Security Fencing: We’ve created security fencing for all types of properties; you can trust us to keep you safe and others out. Colorbond Fencing: Perfect for the extremes of the Australian climate. Driveway Gates and Fences: We provide the entire fencing package. Fencing Supplies: You don’t need to go anywhere else when looking for supplies, its all made on site so you can trust the quality. Aluminium Fence Panels: We promise, our product wont fade, rust or crack up under the weather. You’ll be enjoying our panels for years. Concrete Driveways: Durable, clean and will add value to your home. We’re the best provider of concrete driveways in Melbourne. Exposed Aggregate Concrete: Enjoy all the durability and ease-of-maintenance that you get with contract with an added visual element. Painted Concrete: Turn concrete into whatever you want it to be. Create a tiled, bricked or slate look without paying the ridiculous prices. Landscaping Design: Turn your backyard into a masterpiece and a space you will enjoy for years to come. No matter how big or small, we know how to get the most out of a space. Landscaping Installation: Not only do we design beautiful backyards, we also have the skill to take care of the entire installation. Timber Decking: Turn your backyard into a beautiful living area. You’ll enjoy BBQ after BBQ on our timber decking. Pergolas: We can construct steel frame pergolas of all shapes, sizes and themes.